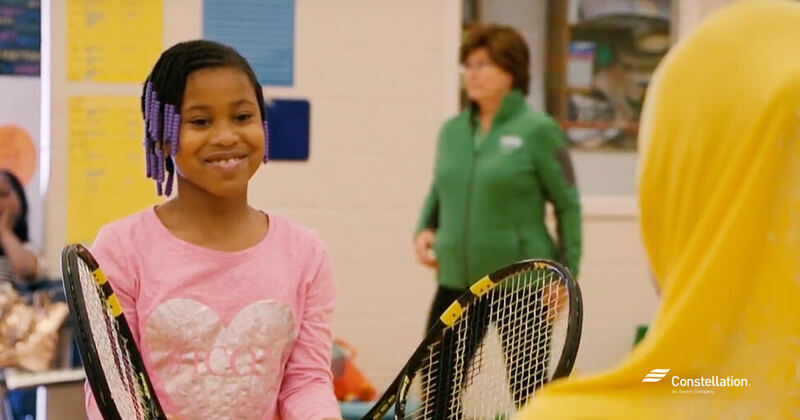 Constellation is proud to announce another winner of the Community Champions award — the United States Tennis Association (USTA) Georgia for its tennis education for children. The USTA is a nationally recognized governing body that officiates professional tennis competitions. Each player who qualifies for the U.S. Open National Playoffs tournament must be a USTA member. The USTA also conducts more than 8,000 tournaments per year for juniors, adults, state high school championships, sectional events, college matches, national championships, tour-level and pro tournaments along with the U.S. Open. In addition, the organization runs programs that bring tennis to schools. Jane Trinkle, the Junior Recreation Advisor for USTA Georgia, says, “Our mission is very simple: It’s to grow and promote the sport of tennis.” The organization has developed a curriculum for elementary school physical education teachers, complete with specific lesson plans and tennis equipment. Beth Breit, a physical education teacher at Avondale Elementary in DeKalb County, Ga., says that the program has been fun, engaging, and challenging for her students. According to Trinkle, “Beth did a great job encapsulating the program and why we do it.” The USTA program is designed to work with all different age groups and ability levels, including adaptive physical education. Amanda Boudreau, Director of Schools for USTA Georgia, notes that tennis teaches “life lessons” and valuable personal skills like how to get along with other people. It all started with Jane Trinkle. Trinkle, a Constellation residential customer, began a conversation with the DeKalb County Schools about a year ago. She learned that the county has a large number of Title I schools, which means that there is a high percentage of children from low-income households. One of these is Avondale Elementary, and Trinkle was determined to get tennis education into the school. 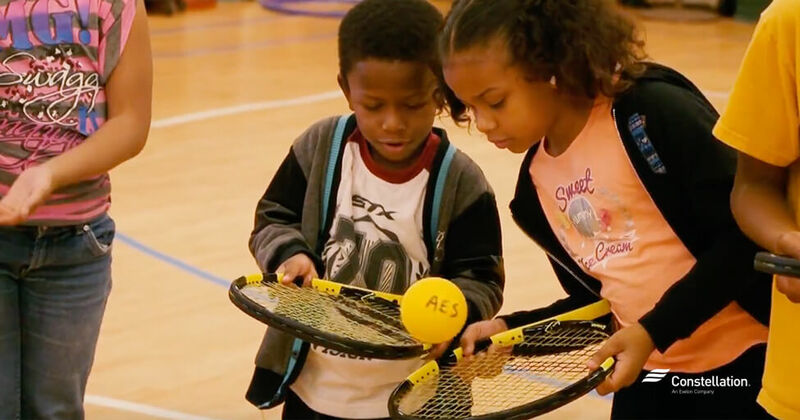 When she received an email from Constellation about the Community Champions program, she saw the opportunity to use it to support the tennis program at Avondale Elementary. As a Community Champions winner, USTA Georgia was able to bring tennis equipment to the students, along with ongoing tennis education. The reason why USTA Georgia selected Avondale to participate in the program is because Trinkle could tell that Breit, the PE teacher, was dedicated to continuing the program. Trinkle didn’t want to simply drop off equipment and move on; she wanted to know that the school would use it in a way that would offer students the opportunity to really learn the game of tennis. It turns out that Trinkle’s instincts about Breit and Avondale were correct. The children really appreciated the program, parents have come to watch tennis lessons and ask questions, and the children are proud and happy to be learning a new sport. As Trinkle points out, tennis isn’t always top of mind in the sports department of many schools, so the USTA’s objective is to allow students the opportunity to try new things and branch out from the more traditional school sports. The USTA program is ongoing with Avondale Elementary. Fiona Hatton, a USTA Atlanta Junior Recreation Adviser, remains in direct contact with Avondale PE teacher Beth Breit on a regular basis. The goal is to eventually create an after-school tennis club in which students can take the next steps and learn actual tennis skill sets. Then onto intramural or school-related leagues in the gym or on the playgrounds. Atlanta is one of the largest tennis communities in the country, according to Trinkle. The Atlanta Lawn Tennis Association (ALTA) has 80,000 members, and it is part of “fun” leagues, parks with lessons and community centers like YMCAs for programs. The USTA maintains programs to keep kids engaged in tennis. There are free trainings for physical education teachers at all pre-collegiate levels through the ATP Next Generation program, which works within the SHAPE America standards for health and fitness. Ultimately, it’s all about facilitating tennis programs in schools and providing the tools for educators to encourage and teach tennis. The Constellation Community Champions program is one way in which the company is giving back to the communities where our customers live. Previous Community Champion winners include the Aldine-Greensport Family YMCA afterschool and summer camp programs and Longfellow Elementary School music program in Houston; Hose2Habitat, which recycles fire hoses to make supplies for zoo animals in Maryland; the Silver Lining Sports Academy in Atlanta, and many more. In fact, Constellation has given over $260,000 for over 520 community grant programs in 17 different states. In Georgia alone, 120 Constellation community grant recipients have received over $60,000 through the Community Champions program. Constellation is proud to be supporting the USTA and other non-profit organizations in schools and the community. For more information on how you can apply for one of our community grants, visit the Community Champions section of our website.